Need Maryland Apostille Services? If you don't want to deal with the trouble of learning a particular government office's requirements or worry about missing something or potentially delaying your certification or apostille, let us take care of the hassle while you continue to manage your other personal or business matters. Call (202) 826-8179 or fill out the form below. * Apostilles from the Secretary of State are placed on Personal and Commercial Documents such as Diplomas, Transcripts, Powers of Attorney, Company Agreements, Birth and Marriage certificates, etc. Apostilles from the US Department of State are placed on documents issued by US Federal agencies such as FBI Background checks, IRS documents, Certificates to Foreign Government, Naturalization documents. We provide availability for fast same-day Apostille Services in Maryland and D.C. We can take this important, complicated, and time-consuming process off your hands. We are also able to provide Authentication and Certification Services through the Secretary of State in DC and the Circuit Court in Prince George’s County MD. Regular service 2-3 business days - $150 (1st document), $25 for each additional page which includes cost of apostille and notarizing documents (if needed) plus travel depending on location/time of day (traffic). Bulk pricing (as low as $60 per Apostille) and Same Day Service Available. Bulk pricing (as low as $60 per Apostille) and Same Day Service Available, Maryland Apostille Services. You may refer to the list of countries below to confirm if your document falls into the Maryland Apostille Services or Certification category. 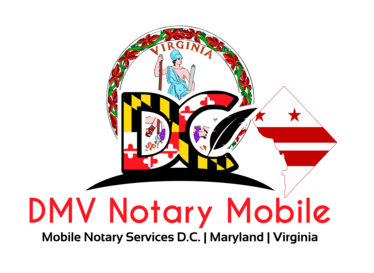 DMV Notary Mobile is able to provide Apostille Service in Maryland through the Secretary Of State and Washington DC for documents notarized in Washington DC and Maryland in as quickly as 24 hours.